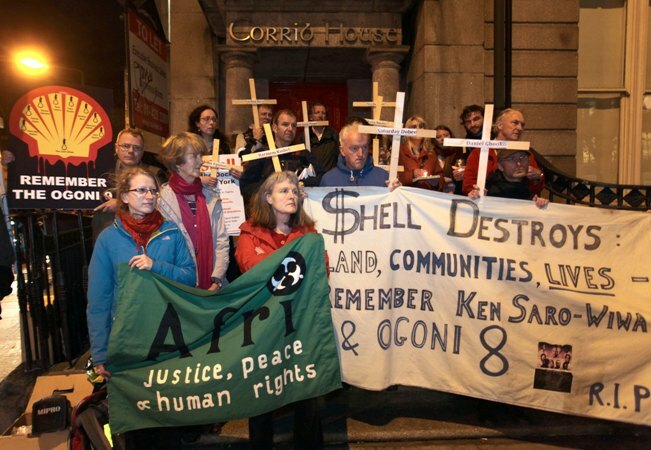 On Tuesday November 10th 2015 at 6pm, human rights campaigners and environmentalists gathered at Shell’s Irish headquarters to mark the twentieth anniversary of the execution of poet and playwright Ken Saro-Wiwa and eight others known as the Ogoni 9. The vigil is being organised by Afri and is supported folk singer Christy Moore and Sr. Majella McCarron, an Irish missionary nun from County Fermanagh who was formerly based in Nigeria where she was a friend of Saro-Wiwa. Ken Saro-Wiwa’s brother Owens, speaking about his brother’s death has said that he fears lessons have not been learned. Joe Murray, organiser of the vigil and Director of human rights and peace organisation Afri, agrees that there is a clear parallel between Ogoniland and Mayo. Willie Corduff, one of the Rossport 5 who spent 94 days in prison at the behest of Shell, says the community in Erris remember the Ogoni 9 on a daily basis. A separate vigil by the Shell to Sea group was held from 12 noon at Shell’s headquarters on 52 Lower Leeson St., Dublin 2.